The management of woodland at Queen’s University Belfast is an important part of the grounds maintenance. A variety of semi natural woodland, planted coniferous woodland and newly planted native woodland cover around 10ha of the campus. This combines with adjacent habitats to form an important urban woodland that is protected in the Belfast Metropolitan Area Plan. There are several badger setts in the mixed woodland. A woodland management policy has been put in place to protect the woodland from the strain of an ever expanding and developing university. It also responds to the need to conserve and create woodlands in Northern Ireland, which has fewer trees than any other northern European country. 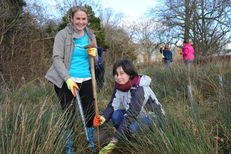 The policy encourages tree planting throughout the campus in support of the Belfast Local Biodiversity Action Plan and focuses on linking fragmented existing pockets. Where tree felling cannot be avoided, as the University develops, felled trees are being replaced at a ratio of 3:1. 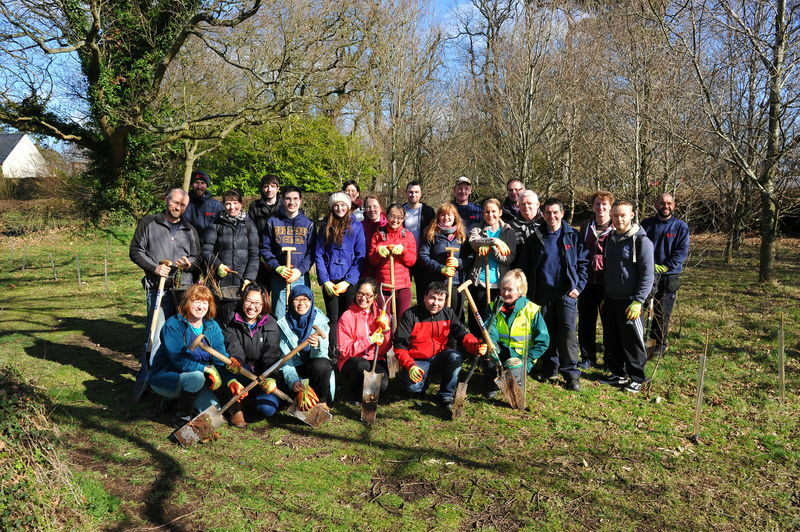 With the assistance of the Woodland trust staff volunteers have been giving their support to the University’s policy actively getting involved in planting trees on campus. 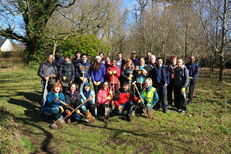 The policy also aims to improve diversity in the existing woodland. Dense growth of species such as rhododendron are being removed as they limit the growth of ground flora. This is replaced by under planting with native tree species. Deadwood is being conserved by leaving dead trees standing wherever possible and leaving any branches that have to be cut for health and safety reasons as log piles. Queen’s is one of ten organisations within Northern Ireland who have signed up to the RSPB Northern Ireland’s Pledge for Nature. Working with the RSPB Queen’s are developing a five year action plan for protecting biodiversity across the estate, as well as working on collaborative projects with other pledge participants to enhance urban biodiversity across Belfast.